1 Can you imagine that there was a poison in your home that was hurting your family? Surely you would do whatever it took to help your family, find the poison, and get rid of it. Your body has a system to do that as well. It does it all the time. That system is called the excretory system. 2 The main organs that get rid of wastes in your body are the lungs, kidneys, and skin. The lungs remove waste gases during respiration. The skin removes dead cells and sweat. 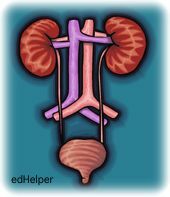 The kidneys remove liquid waste in urine. 3 There are two kidneys in your body. They are reddish-brown and small - only about 10 cm long. Each is located on either side of the spine below your ribs. They are shaped like beans. They are as important as your heart in terms of needing them to work in order to survive.